Play continued on the pitch behind him. 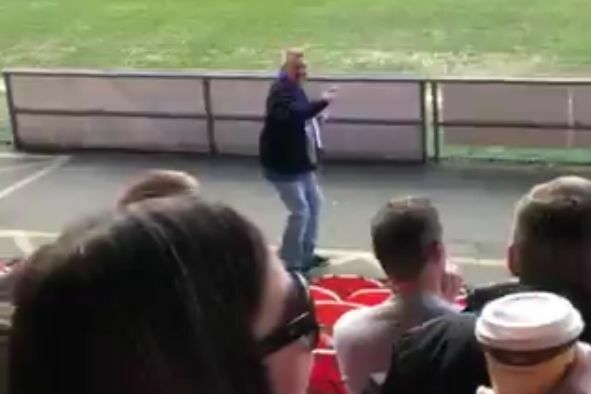 A Peterborough fan could be seen dancing in front of the away support at Blackpool while the game was going on behind him. Play continued on the pitch at Bloomfield Road on Saturday while a man wearing a Peterborough United scarf paraded himself a short distance from the front row of seats in a half-empty stand. Fellow travelling supporters can be seen and heard giggling as the bloke carries on facing sideways, despite the football also continuing in the background and no music being played over the loudspeakers. He will have gone home happy too, as the visitors won the League One tie 0-1 and remain in the hunt for the play-offs.